Alberto Granado Jiménez (8 August 1922 — 5 March 2011) was an Argentine biochemist. He traveled through South America in 1951 with his friend Che Guevara on a motorcycle. They kept a journal about the trip and what they saw. These writings were the basis for Walter Salle's movie, The Motorcycle Diaries (2004). Granado was born in Hernando, Argentina, and later studied chemistry and pharmacology at the University of Córdoba. Active in politics, he spent time in prison after taking part in student protests against the government. 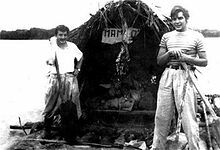 He met Che at university, and in 1951 they traveled thousands of miles and finally ended up in Caracas, Venezuela. Che went back home to finish his medical degree, but Granado stayed and worked in a leprosy clinic. Granada moved to Cuba in 1961 and set up the school of medicine at the University of Santiago. He later moved to Havana and was able to work on scientific research. He died in Havana in 2011. He asked for his ashes to be scattered in Cuba, Argentina and Venezuela. ↑ 1.0 1.1 1.2 1.3 1.4 Burnett, Victoria (6 March 2011). "Che Guevara's 'Motorcycle Diaries' Partner Dies at 88 - NYTimes.com". The New York Times. New York: NYTC. ISSN 0362-4331. Retrieved 23 October 2011.